Shopping for a new bed can be exciting but also downright annoying. You will agree with me when I say we all want only the highest quality products for our money. If you have narrowed your choice of mattress type and material to memory foam, rest assured that most people prefer it over any other. In this roundup and buying guide, we have selected nine best rated memory foam mattresses for 2019. We evaluated all products based on material quality, comfort, support, and cooling. We also didn't include any option that scored below 8.0 (out of 10). So, whichever you pick from our list, you can rest assured that your sleep will improve and that it will serve you well for many years. 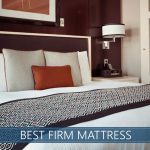 If you are looking for even more options, we have a new and updated list of best mattress brands for 2019. But if your mind is set on this fantastic type, read on, and we're sure you will find one that suits your sleep preference. Are There Affordable (Cheap) High-Quality Brands? Should I Buy My Bed Online? 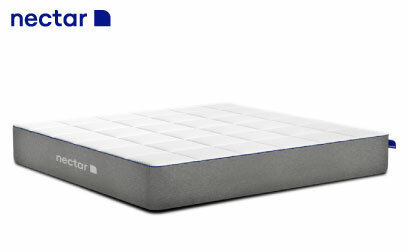 When buying a memory foam mattress, Nectar offers exceptional value. 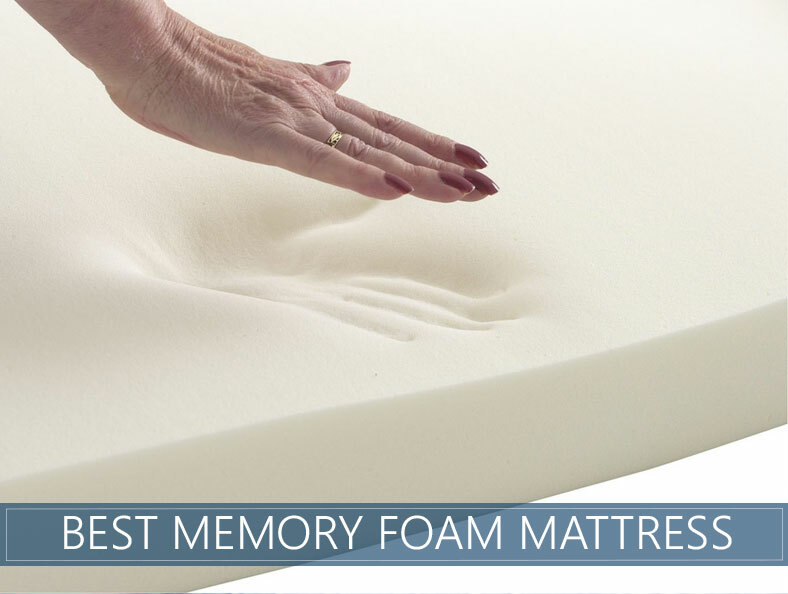 While it incorporates the reasons we love traditional memory foam, such as great pressure relief and deep contouring, it has breathability and cooling elements, too. Its cover has a soft, almost silky feel on top and the Tencel fabric dissolves moisture and heat by wicking it away. 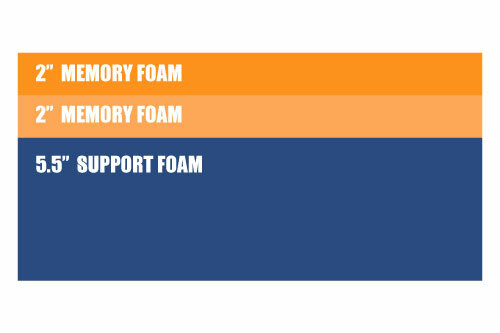 Two layers of gel memory foam serve cooling and comfort functions. Why is it special? Closer to a budget price, Nectar has features and materials that feel higher-end. It is generously backed by a lifetime warranty and 365-day trial period. Having an entire year to try out a bed is almost unheard of and Nectar gives sleepers plenty of time to adjust to the bed and see if it is a perfect fit. In addition, it works with every type of frame. Want to learn more? Check out our complete review here. The Layla Mattress is our pick for pressure relief. It is double-sided with medium-soft and firm comfort levels, meaning that you can adjust the firmness depending on your personal preference. However, the medium-soft side will give you a melting-into-the-bed sensation that many people like about memory foam. What makes it unique? Layla’s memory layer is infused with copper, which is a newer innovation in the industry. Copper is a good conductor of heat that draws it out and away from the area closest to sleepers. Since traditional memory foam is known to sleep warm, the copper provides a successful solution to common heat problems. The layer underneath the copper infusion is Air Flow foam, which has an egg crate design to help with airflow, also aiding with cooling. There is a lot of buzz about the additional health benefits that the copper in Layla may provide. We recommend that you conduct independent research on this topic since we are not science experts. However, it is antimicrobial and creates an all-around pressure-relieving night! Need more info? Check out our complete Layla analysis. 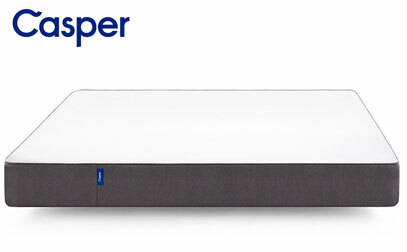 Casper is one of the biggest brands in the bed-in-a-box industry. Although their original model has 1.5-inches of memory foam, we believe this amount works to its advantage in combination with its medium firmness when it comes to catering to all types of sleeping positions. What stands out? Casper has recently updated their original model to include a Zoned Support™ layer. The brand strives to create a balance between alignment and comfort, and their newest version is created to do just that. In their Zoned Support™ layer, they use a softer foam under the shoulders for even better pressure relief. There is a firmer foam around the hip and core region in order to support heavier weight concentrations and keep the spine aligned. An open-cell design and placing the memory layer under the top layer helps to keep sleepers as cool as they are comfortable. This is a quick-responding option, which is great if you want pressure relief without the slow response. It makes it even easier to move around. Still not sure if it's good for you? Check out our full review for more information. Half the price of comparable luxury mattresses, Loom & Leaf by Saatva presents a high-end option for much less than in-store brands. From its organic cotton cover to a woven thistle flame retardant and eco-friendly foams, the brand has incorporated natural materials into its design, giving it a rich feel. Handles on the sides are an extremely nice touch that makes the bed easier to move. Why is it special? 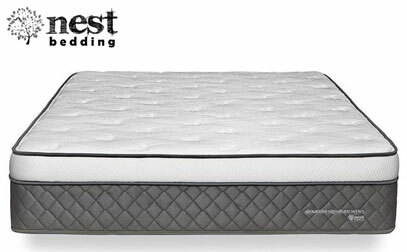 In addition to its luxury feel, it has a special Spinal Zone Gel layer under the quilted cover to give the spine extra support and cooling, and gel is swirled into its top memory foam layer. We also noticed that it has exceptional edge support for a foam bed. This is a great fit for people who like enjoy a slower-responding feel and want additional support. While it comes in two firmness levels, Relaxed Firm and Firm, it is especially good for back and stomach sleepers because it is slightly firmer than other beds we have come across and it has the Spinal Zone Gel layer. Unlike the other beds on this list, it is not compressed and shipped in a box. Instead, Loom & Leaf provides Free White Glove Delivery – and free mattress removal. For full list of features and in-depth analysis, see our full review here. 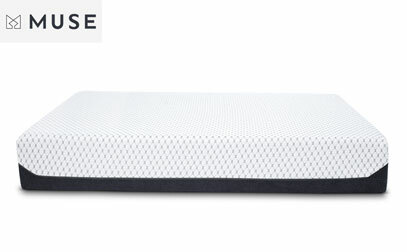 Muse by ViscoSoft uses high-performance materials and memory foam to create cooling and contouring all night. There is a slow response and hug to the medium firmness option, and soft and firm options are also available. What makes it unique? This brand made a concerted effort to provide top-of-the-line cooling solutions, and their cover impressed us by how cool it is to the touch. Since traditional memory foam can overheat, Muse is great news for people who like the feel of memory foam but always find it too hot. The attractive cover, which can be unzipped and washed, is made from temperature control fibers that wick away heat. Their dense foam has cooling gel in it to further regulate heat. Because of its dense foam core, we feel that it will work well with most body weights without the risk of bottoming out. It is also an excellent solution for light sleepers who are easily disturbed by motion, as it has a high level of motion isolation. 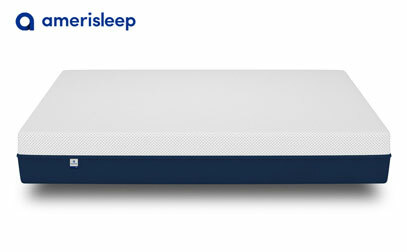 The Alexander Signature Series® by Nest Bedding is a luxury bed-in-a-box model. If you are looking for a memory bed with a firmer feel and less sinkage, their Luxury Firm option strikes a balance of strong support and pressure relief. There are handles on the side to reposition the bed with ease. The Luxury Firm may be ideal for stomach sleepers because they need extra support to keep their hips from sinking in and causing their backs to bow. This model also works well for back sleepers who prefer a firmer feel, although side sleepers may find their Medium option more conducive to their pressure relief needs. What stands out? In addition to its luxurious look and feel, Alexander Signature Series® has four high-quality layers inside the bed. It has a Thermic Phase Change Cooling Fabric that helps regulate temperature. Nest Bedding offers a Lifetime Comfort Guarantee. This means that if you want a different firmness or size after the initial trial period, you can purchase a new bed for half price. All of their mattresses are made to order. Amerisleep has a range of mattresses with different firmness levels and the AS3 is their medium firmness option. Because this is a medium firmness, most individuals will find it comfortable and it is a good fit for most combination sleepers. While there is a slow-responding memory layer, it is quicker than some brands we have seen and the bed is easy to move around on. Why is it special? The foam in the bed is more eco-friendly because plants are substituted for some petroleum that is typically used to create foam. Amerisleep is proud to share that their process does not produce air pollution and it meets the standards of the Clean Air Act. Amerisleep has taken several steps to help their bed sleep cooler. They have included Bio-Pur™ foam and open-cell structures that help with heat dissipation and further breathability. In addition, the cover is made with Celliant®. This material takes heat from the body and turns it into infrared. There may be other additional advantages to using Celliant®, however, we recommend conducting your own research on this topic, as we are not experts on it. While Bear Mattress has plenty of benefits for all individuals, it is our pick for athletes and athletic folks because it has a few benefits that work especially well for them. It has less of a deep contouring, slow-responding memory foam feel while keeping the pressure relief associated with that style of bed. Even though there is a memory layer in the bed, it still has bounce, which some people miss in traditional memory beds. The top memory layer is slow to respond but quicker than other a few other beds on this list. What makes it unique? A combination of graphite gel in its memory foam and Celliant® technology in its cover helps keep sleepers from overheating. The brand reports that Celliant® technology can improve tissue oxygen levels, but we encourage you to research this on your own, as we are not experts in the science behind it. In addition, Bear gives back to kids and helps them with the means to play sports. So far, the company has donated to every State and over four million kids have been helped. For a detailed look at this model we have a full review. Check it out here. 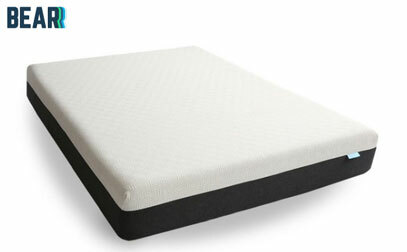 Ultimate Dreams Supreme 12″ Gel Memory Foam is made by Dreamfoam, a brand by Brooklyn Bedding. As the manufacturer owns their factory, they can produce high-quality budget products that companies with middlemen and outsourced materials and labor need to charge more in order to produce. What stands out? 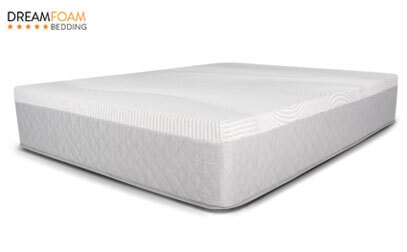 Ultimate Dreams Supreme has the traditional feel you would expect memory foam to have. There are four total inches of memory materials that provide deeper contouring and there is less bounce. Ultimate Dreams Supreme has a few qualities that make this a clear standout budget option. It does a good job of supporting and relieving pressure for nearly every sleep position. Dreamfoam has also included gel in the memory foam to negate the heat traditional beds tend to trap. It is an all-around solid option that is conveniently compressed in a box and delivered to your door. Want to find out more? Head over to our full bed analysis. In most cases, Memory Foam is polyurethane combined with other chemicals. Those additional chemicals add to the viscosity and density of the end product. You may see it referred to in some cases as viscoelastic polyurethane foam. The origins of this material can be traced back to 1966 when NASA developed it. The original intention was for this material to be used for aircraft cushions, but it was quickly discovered that it had potential far beyond that application. It was released to the public domain in the 1980s, and it has gradually gained in popularity since that time. It has been used in medical applications for some time and has more recently – thanks to reductions in cost – become a material that is used in a range of home products like mattresses. Read more about how memory foam works here. This amazing material that many a consumer reports a unique and very recognizable feel with. It hugs and contours to your body as you compress it, providing exceptional pressure relief and support. The material will gradually shape to match the outline of your body, meaning the mattress is essentially customized for your needs each time you lay down. When you get up, the material will regain its original shape quite, readying itself for the next use. Another feature the material has that can be advantageous in the mattress application is the motion isolation it offers. Motion isolation means there is a very little transfer of energy from one side of the mattress to the other. If your partner is tossing and turning in the night, for instance, you are unlikely to feel much of anything as you sleep. This is not a feature that can be claimed by a traditional spring mattress, and it is a big part of its popularity. Viscoelastic properties are what makes it unique, and it’s worth noting that poly foam without viscoelastic properties is not a memory foam. The main problems some people complain about is slow responsiveness and heat retention. Response means how quickly a material recovers when compressed. 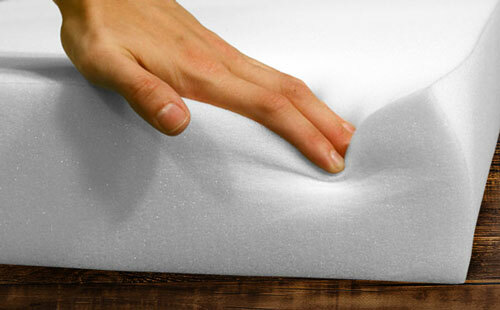 Memory Foam has a very slow recovery rate and takes a few seconds to return to original shape. This also means the material will contour to your body better. But, the slower response is also something many people find as negative, so it’s down to personal preference. Heat retention is a problem that earlier versions of foam struggled with. The material hugs your body, creating hotspots, and it can quickly become a nightmare, especially in summer days. Advanced gel covers and an open cell structure fix the heat issue to a degree, but don’t expect all types of this foam to sleep as cool as coil or latex. Do you need a “colder” option? Read our full guide with the best cooling mattress picks. Heat Retention Graphic - How cool or hot each type of mattress sleeps. While shopping, be sure to think about how important edge support is to you. For some people, it is a minimal purchasing factor. However, for others, it is one of the most important qualities to find in a bed. With the rise of memory foam bed-in-a-box brands, sometimes shipping so conveniently meant that softer edges were a necessity for compression. However, other brands have found ways to combat lacking edge support, through reinforced materials and layers like strong foam rails. Chances are, if you share your sleeping space and need more room or if you enjoy sitting on the edge to put on clothes or shoes, you might want to consider a brand with proven stronger sides. You Sleep Too Hot – A significant issue with this material is that has a greater potential to sleep hot, even with cooling gel. While it will be fine for most, if you tend to sweat or you are in a warm climate, you might want to consider other options. You are a Stomach Sleeper – If you prefer to sleep on your belly, you will likely need a firmer surface for this position, so you do not sink too deep. If you go with memory foam (which is great at relieving pressure points), consider opting for a firmer model overall. There are many out there with this material that work well; just be careful of choosing something too soft with deep sinkage. You are Suffering from Back Pain – For anyone who reports backaches, you will need a material that conforms to your body and provides pressure relief while staying supportive. Memory-foam can be perfect for this, and it’s often the most recommended for back pain. You Love Sleeping on Your Side or Back – Contouring and hug are especially important for side sleepers as firm materials that do not conform tend to create pressure points on your shoulder and hip joints. You are a Bit Heavier – Foam can be perfect if you are a heavier person because you will need that extra pressure point support and contouring. During your consumer research, you will encounter products priced at a very affordable $200 and those at $2000, so obviously there is a difference. Let’s take a look at the most important factors that determine the quality of this amazing material. What do those numbers mean? They refer to the actual weight of the product, with a heavier weight representing a denser material. The weights are measured per cubic foot, so a mattress with a rating of four pounds indicates that one cubic foot of the material used would weigh four pounds. As you would expect, heavier products are going to be more expensive than lighter options, but it also means that they can offer better support and are more durable. The thickness of the layers is an important factor when determining sleep quality. It has much to do with the manufacturer and a mattress in general. As a general guideline 4” or so in the comfort layers can be good to look for, but it can be split into two comfort layers. The firmness is highly correlated to the weight that has been used. Heavier mattresses are going to be firmer and more supportive on the whole, while lighter versions will be softer. Of course, there will be some variation in firmness from model to model even when comparing weights, so check on the stated firmness of any mattress before making a purchase. To measure firmness specifically, a scale known as ILD (indentation load deflection) can be used. On this scale, a higher number, like 12 or 13, is going to be firmer than an 8 or 9. We use a scale of 1-10 (ten being the most firm) with the products we review and outline other details about the firmness level. So, no complicated calculations needed. Check our firmness guide here. The lifespan that you should expect is going to have a lot to do with the quality of the product you purchase. Naturally, spending more money on a high-end mattress could return you a better product, which can be expected to hold up for a longer period. In general terms, you should expect to get somewhere in the range of seven to ten years of quality performance from a memory foam bed. As was the case with lifespan, better products tend to give you a longer warranty. Some of the high-end options on the market will offer you 20 years of coverage, while less-expensive models only come with 5 years. Usually, the quality of a mattress will be directly related to the warranty which is offered, but it’s not always the case. Off-gassing is one of the leading complaints. A new product is going to need to get rid of its chemical smell at first after decompressing, which is a process known as off-gassing. This usually only lasts for a short period, but it can put some people off when they are just getting started on their new mattress. If you do decide to buy one, it is important to understand that off-gassing is likely to be part of the process. You may be concerned about more than just sleeping when it comes to a new bed. If you are planning a romantic evening, the difficulty of moving around on this type of mattress is often noted as a negative, while the quiet nature of memory foam can be positive in some circumstances. Want more? Check our favorite couple’s beds and see the individual reviews. As competition in the online mattress space heats up, both established and startup brands are looking to diversify their offerings, and one way they’ve done it is to source higher-end materials, while still keeping their prices low. These constructions put a premium quality that is packed into impressively tall mattress profiles. Memory beds in this space are putting an emphasis on performance and quality, sourcing only the highest quality foams with additives like gels, graphite, and copper that update features like temperature control. Beds with performance foams are often priced quite high in the retail space, but an online sales model can definitely make quality more attainable and affordable. There are several ways that online companies manage to keep their prices low while still offering excellent value. Some own their own manufacturing facilities and reduce overhead that way. Online sales and made-to-order beds also cut down on the costs of storing inventory or displaying them in storefronts. 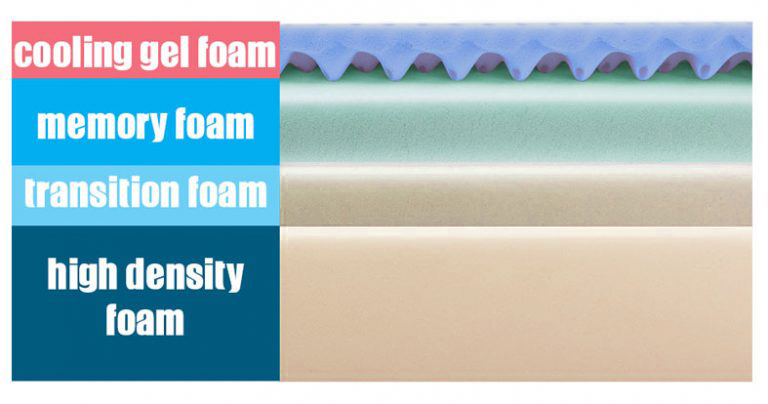 As mentioned previously, there are many polyurethane foams around, but not all of them are “memory.” Over the years, companies have experimented with this material and came up with some variations with a different hug, contour, cooling, sinkage levels, and durability for their consumer. While there are many others, here are the three most common types you will see on the market. To battle heat retention, manufacturers came up with a solution in terms of open-cell foam. While it still provides a similar and familiar feel, small air pockets provide a much cooler sleeping experience and enhanced response time. 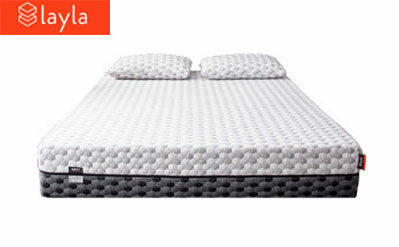 This is the most popular variation you will see – even on mid-grade mattresses these days. This gel is usually infused during the manufacturing process and evenly spread across the entire surface, or it can be incorporated as tiny beads or liquid. Gel solved the biggest memory foam issue of heat retention by evenly dispensing the heat instead of creating hot pockets. Don’t get fooled by low ticket products advertising gel foam mattresses, as some just won’t do the trick. If you pick a quality product though, you can expect a much cooler experience than on a traditional one. Liquid gel can sometimes provide better cooling compared to some beads. Choosing a density of PCF 3.0 and higher can be an indication of a higher-quality product. Opt for thinner, more breathable covers to help. Plant-based or natural memory foam mattresses became some of the most popular on the market, though some are combined with traditional materials. The reason is a more environmentally friendly process and replacement of petroleum-based substances with bamboo, tea, soy or Aloe Vera. These materials are much better at heat distribution and provide much needed joint pain relief and better motion isolation. The reason so many companies are exploring online sales models is that they can offer significant cost savings in more of a budget range by bypassing middlemen in the traditional supply chain. This enables them to offer the same quality you’d see in a store for much less; cheaper than you’d typically pay a brick and mortar retailer. Many people are nervous about buying something online sight unseen and may be tempted to pay higher prices for in-store models, rather than an internet discount. However, research shows that you will receive a much better impression of whether a mattress works for you by sleeping on it for at least a few weeks rather than a quick 10-minute test drive in a store. Most online brands offer generous sleep trial packages and will refund your money if their product isn’t a perfect fit. Coil (innerspring or coil-on-coil) provide more airflow and cooling than almost any other type. Nowadays, many products include a layer of memory foam on top for extra comfort. The combination of two results in improved lifespan, cooling, and you still get that familiar foam feel. One such example is luxury mattress from Saatva, a sister company of Loom & Leaf. Latex is sometimes considered as the creme de la creme of materials, and in most cases, the price of latex beds is higher. It’s not heat activated and typically provides a much cooler sleep experience even compared to gel foam. It has faster response and more bounce, but it has a completely different feel. You won’t get that much hug and extremely deep contouring with this material. An example would be Zenhaven mattress. These days, many manufacturers think that combining different types of materials can negate all/most negative sides and you can end up with a much better product overall. Typical hybrids are coil or latex with foam. Another example of polymer and springs is the Purple bed. 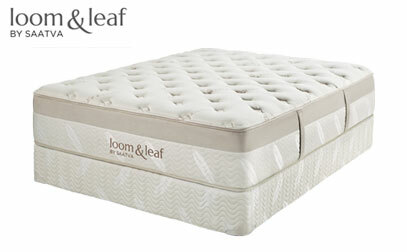 And yet another fantastic example is the Leesa mattress that combines latex-based foam on top with memory foam below it. To save money, you can opt to purchase a topper rather than an entire mattress. However, mattress toppers are not always as effective as desired, especially when they are placed on an aging mattress. If the underlying mattress is starting to sag or otherwise fail, it is unlikely that the topper is going to do anything to improve performance. Most likely, you are going to want to opt for a mattress rather than a topper when a good night’s sleep is your top priority. As you can plainly see, there are plenty of high-quality memory foam mattress brands on the market today. If you would like to purchase one for your own home, the beds listed above are a great place to start your search. In fact, there is a good chance that you will find a winner from that list without having to go any further. We hope you now have all the information you need to make an informed purchase. Thank you for taking the time to review our buying guide, and we wish you the best of luck with your selection. Here’s to a great night’s sleep! I was a big fan of spring beds but you guys made me change after like 6 years! My choice was Dreamfoam Arctic Dreams and so far I can’t tell you how happy I am. I wake up feeling fresh and I need like 1h less sleep per night! Nectar seems good to me – 365 days trial, life warranty and pretty affordable price. Sounds like a good deal. I had an injury and was immobilized for a quite long period, so I gained a lot of weight and my old mattress doesn’t seem to suit me anymore. I’m looking to buy a foam mattress that will provide me good support because I hate how I sink in my current one. I wake up stiff and moody. Any suggestions on which one should I try? You can find a tone of foam mattress that are especially designed for heavier people. When I was pregnant and heavy I bought Saatva. I would suggest you to buy firmer one, in order to avoid sinking. 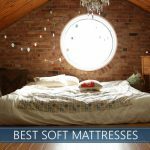 Which mattress do you recommend for under $1000? I’ve been thinking of purchasing Muse for me and my wife. Since my wife has very restless sleep, we’ve been looking to find something with good motion transfer. Anyone had experience with Muse? How do I choose optimal level of firmness? We’re both side sleepers. Hi Donald, I have a Muse and I it’s been really great for me so far. I am also a side sleeper and I can say it provides truly good support. As far as motion transfer is concerned, my personal opinion is that it’s the best mattress for couples. I didn’t try them all naturally, but it’s definitely the best one I’ve tried so far. I have a medium version, btw. Nectar has 365-day trial, lifetime warranty. It maybe the best one in this list, right? Hi everyone. I play basketball for almost 6 years now, and Bear mattress instantly draw my attention. Does anyone has one? What’s your experience? Is it really good for athletes? If you like not too firm, or too soft feel, Bear will most definitely meet your needs. I’m having second thoughts about memory foam vs. regular spring. What’s really the difference except contouring body and different feel? Hi Sandra! There can be a whole host of differences, from temperature, maneuverability, support, pressure relief and bounce. In general, innerspring will have more bounce and airflow, while memory foam should have more motion isolation and contouring. If you sleep hot, you’ll need to look into cooling technology because sometimes memory foam can sleep hot. I hope that helps! There’s a lot differences. Not only material and feel, but also the way it supports your body. A lot of memory foam mattresses are constructed specifically to help you with pain, so if you suffer from back, neck, shoulder or hip pain, you should consider some memory foam mattress, at least that’s my opinion. On the other side, if you don’t like memory foam feel, maybe you can go with some hybrid. Still, there’s also many good innersprings, so basically it’s all up to your needs and preferences. I like the Novosbed one but all your links point to Amazon. They are huge in canada and wondered if you know much about their other Douglas and logan and cove lines. thanks in advance.